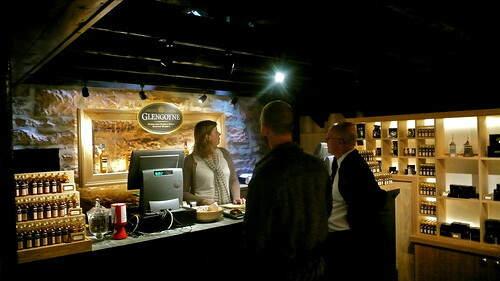 We spent the afternoon at Glengoyne distillery yesterday, which enjoys a reputation as the world’s most beautiful distillery. 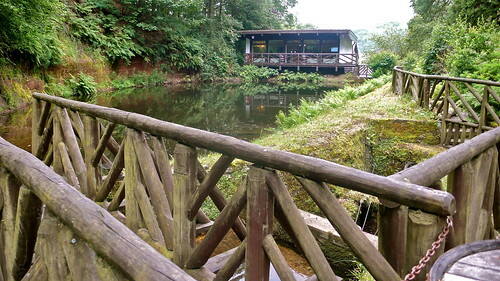 It really is a lovely place to visit and walk around. As you can see from the photo, it’s at the bottom of a hill – actually an extinct volcano – and at the foot of the burn (a Scottish word for a stream) from where they source their water. 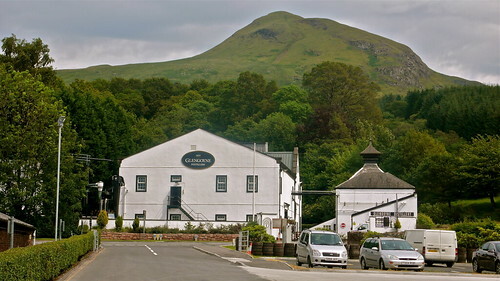 It also gave the distillery its original name – Burnfoot. Glengoyne pride themselves on their entirely smokeless whisky flavours. 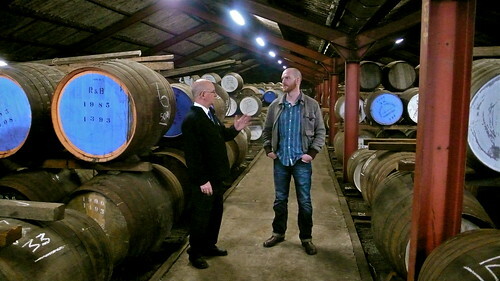 The malt they use in their distilling process is air-dried, rather than dried over a peat smoke fire. 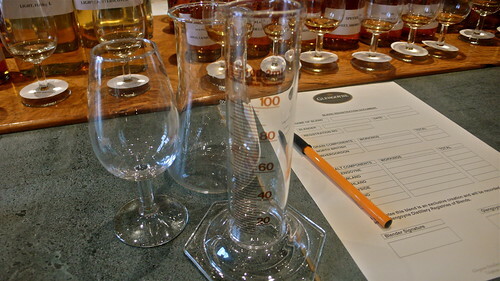 The resulting whisky is smooth, sweet and light. It’s the silent season, so everything is shut down for maintenance, repairs and a jolly good clean. It’s quite amazing to walk around and see the inside and workings of the machinery that makes the whisky – to actually look inside a still, rather than just admire it from the outside. The shop has been refurbished and they have a ‘fill-your-own-bottle’ of single cask, unique to visitors of the distillery. We tried a few drams – the 10 year-old, the Isle of Skye 12, the Glengoyne 17, and two single casks, one of which was an exceptional port-finished whisky. We had a look around the warehouse as well as the distillery – perhaps most interesting because of the charcoal on the floor, which is there to retain moisture so that there’s less evaporation from the barrels. 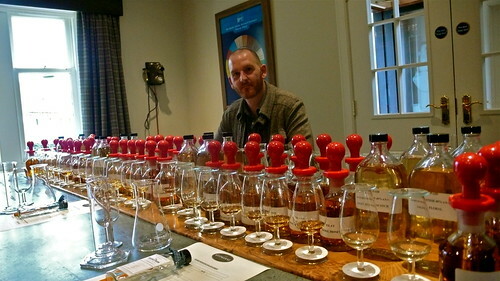 But the highlight of the tour was the master blending session. We were taken into the tasting room, and given samples of a range of different whiskies to nose from all of the whisky-producing regions of Scotland. We were talked through the process of making a premium blend whisky, consisting of primarily grain whiskies, but flavoured with a range of different malts. Clutch and I made competing whiskies using different proportions and measures of the different malts, adding the Lowland malts to bring up some of the citrus notes, Highland to add a touch of dried fruit, Speyside for the sweetness and sherry, Island for pepper and honey and Islay to add a smoky, peaty air to the proceedings – and of course the Glengoyne itself for apples, vanilla and toffee. Not that it was a competition or anything, but I totally won. Mine earned the right to be known as the Dubber and Clutch Premium Blend, and we think it’s really very good. We filled a 100ml sample bottle and then shared the remainder. And this coming weekend, we’ll give you the chance to WIN that very bottle – the only bottle in the world of Dubber and Clutch Premium Blend. Stay tuned here, and follow @twhisky on Twitter for details of how to win that unique whisky, made by the very hands that typed this blog post that you’re reading right now.